Melor, also known as Nona in the Philippines, will continue to strengthen into a super typhoon before it barrels into the Philippines. Melor is on a collision course with the central Philippines and in an environment conducive for further strengthening. Residents should be rushing to complete the necessary precautions to protect lives and property. Melor rapidly intensified into the equivalent of a Category 4 hurricane on Sunday evening, local time. With further strengthening expected, Melor is expected to become a super typhoon before making landfall on Monday. Melor will track over or dangerously close to the northern coast of Samar Island before barreling into southernmost Luzon Island on Monday. Powerful winds in excess of 155mph threaten to cause widespread destruction in southernmost Luzon and potentially along the northern coast of Samar, depending on how close Melor tracks. This includes Sorsogon City and Legazpi City. Near and north of Melor’s centre, the eastern coast of southern Luzon will be subject to an inundating storm surge. “Melor is a very compact typhoon, so that will prevent its most devastating impacts from extending too far from its center,” stated AccuWeather Meteorologist Adam Douty. Winds in excess of 73mph extend only 35 miles away from Melor’s center. 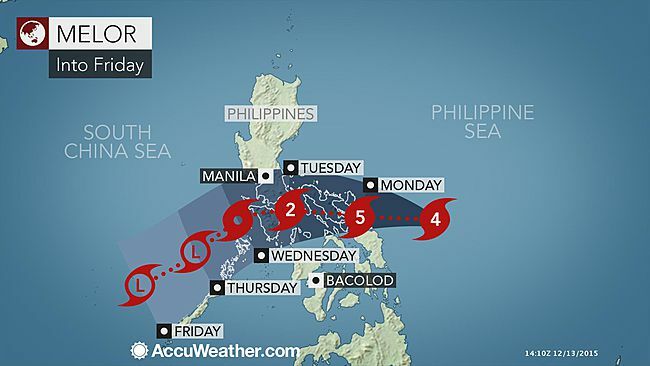 Melor will weaken some as it crosses the central Philippines on Monday night into Tuesday. However, damaging wind gusts higher than 100mph will still target the remainder of southern Luzon to Mindoro. Rainfall amounts could top 12 inches in the central Philippines, especially across the higher terrain. Life-threatening flooding and mudslides are a serious concern. Also potentially in the crosshairs is Manila, the capital of the Philippines. While wind from the storm should not be nearly as strong as where it makes landfall in southern Luzon, heavy rainfall will be a possibility. After blasting the Philippines, Melor is expected to weaken further as it turns southwestward into the South China Sea later this week.